Once again we see how Auras are trying to get around the inherent disadvantage they generate. This one automatically sacrifces itself to regenerate its host if it would be destroyed, sort of like Carapace. Also it's keyworded for some reason. Why didn't they just give it Carapace's rules text? Oh well. I'm not happy about Mammoth Umbra costing five mana, but it is a good card. Not only does it give its host a big power boost and vigilance, it also gives it a big toughness boost, which makes it harder to kill with damage, and of course sacrifices itself to save its host, making it that much harder to kill. I suppose after Mossbridge Troll, something like this would be the next logical step: the creature doesn’t regenerate, so Incinerate and Terror bounce off it, and it doesn’t prevent damage, so Unstable Footing has nothing to say about it. I always had a feeling that elephants were even more highly evolved than people were, and this might just prove it. This is a very nice idea, so if I decide to Day of Judgement my creature will live? Nice and interesting. What other cards will grant Totem armor? Welcome back readers today’s card of the day is actually one of my favorite cards spoiled so far, once again not for the card itself but the potential of the mechanic. Mammoth Umbra is a creature enchantment that grants +3/+3 and vigilance to the creature. Historically creature enchantments have resulted in card disadvantage for the player enchanting their creature. The advent of Totem Armor changes this significantly. Totem Armor reads if enchanted creature would be destroyed instead remove all damage from it and destroy this aura. This single handedly insures that your enchanted creature wont cause you card disadvantage. This particular card wont see much play outside of limited but if this mechanic brings cheaper cards to the forefront it will be amazing. 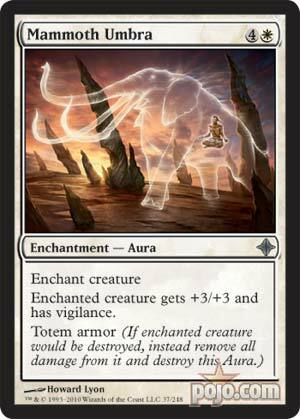 Michael "Maikeruu" Pierno Mammoth Umbra - Totem Armor finally answers the issue of the two for one disadvantage of auras and can turn even a 1/1 into a serious threat.